Death in Hospital Day- Notes from St. Jame's Hospital Workshop. Hospice principles in a hospital setting. 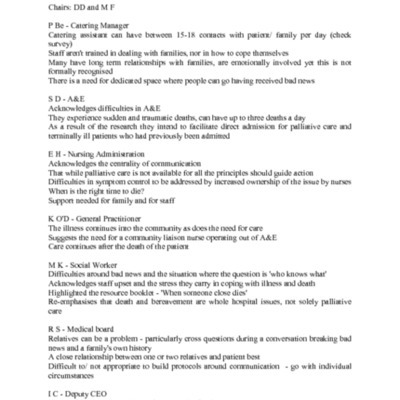 Notes from a meeting between hospital workers in St. Jame's Hospital, on the Death in Hospital Day, to discusses the application of hospice principles in a hospital setting. Hospital and administrative staff of St. Jame's Hospital. Held: 2nd of December, 1999. Complied: 3rd of December, 1999. Contributors: Hospital and administrative staff of St. Jame's Hospital. Hospital and administrative staff of St. Jame's Hospital. Orla Keegan., “Death in Hospital Day- Notes from St. Jame's Hospital Workshop. ,” Archives Hospice Foundation, accessed April 22, 2019, http://archives.hospicefoundation.ie/document/315.